The red-tailed hawk is the most common bird of prey in North America, but because this buteo member of the Accipitridae family has many plumage colors, it can also be one of the most challenging to identify. Western populations have more variation, but fortunately every type of red-tailed hawk has similar characteristics and field marks that can be noted. This fact sheet can help birders feel more confident about the red-tailed hawk and how to find and identify these raptors. The red-tailed hawk is common and widespread, but can vary from very light or almost white shades to nearly black coloration, which makes proper identification difficult. Birders who are aware of the key characteristics of these common hawks can feel more confident about recognizing and identifying them. On all these raptors, the large bill is strongly hooked with a yellow cere at the base. Genders are similar with brown mottling on the upperparts, though the amount of white in their plumage can vary greatly. The wings are light below with a brown border, interior barring, and bold dark “commas” at the wrists, as well as a distinctive dark patch at the patagiaum, the wing's leading edge. The head is lighter brown, and the tail is rust red with a thin dark band near the tip. The chest and throat are white and the abdomen has a wide band of brown streaks or spotting. The legs are feathered with faint rusty barring and the feet are yellow. Juvenile red-tailed hawks do not develop the red tail until they are two years old, and instead their tails are finely barred. The red-tailed hawk’s signature descending “kreeeeeeeer” screech is commonly used in movies, no matter what bird of prey is pictured. These hawks also have a strong “screee” scolding call and chicks in the nest use a high-pitched begging call to attract attention from their parents. 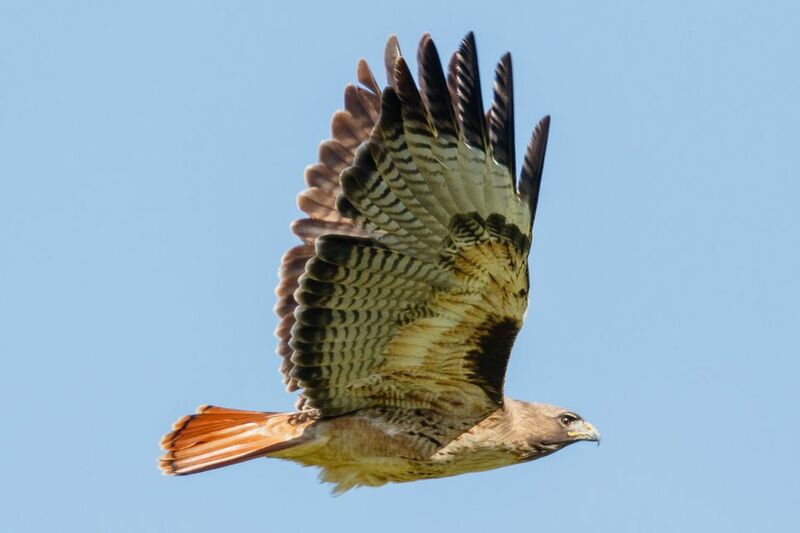 Red-tailed hawks are common and widespread throughout the United States, Canada, the Caribbean, and Mexico in a wide range of habitats, including grassland, tundra, desert, marshes, and forests. These birds can even adapt to suburban areas. Canadian bird populations and those in the extreme northern United States may migrate seasonally depending on weather severity and food supplies. In most of their range, however, red-tailed hawks do not migrate. Red-tailed hawks are commonly seen perched on poles, fences, or trees near roadsides as they scan fields for prey. In flight, they hold their wings fairly level and their primary feathers may splay slightly in a "finger" pattern. These birds can be aggressive when nesting, and may harass larger raptors such as ospreys or eagles that enter into their territory. They can also occasionally dive at humans who approach too closely to their nests. Red-tailed hawks are carnivorous raptors that hunt a wide variety of prey. Small and medium mammals, reptiles, small birds, and large insects may all be part of their regular diet, depending on what prey species are most abundant at any given time and in any hawk's specific territory. These hawks routinely perch on trees or power poles adjacent to open areas while they watch for prey, and they will quickly swoop down on unsuspecting morsels. They will also scan for prey while soaring above fields. They may take smaller prey back to a perch to feed, while larger prey is eaten on the ground with the raptor hunched over it in a mantling position to hide the meal from potential competitors. After eating, these birds will stay perched and calm as they digest, and will regurgitate pellets to expel material they cannot digest. Red-tailed hawks are monogamous birds that will return to the same nesting site each year. The nest is a pile of sticks lined with vegetation, smaller sticks, or other fine material, and is usually placed in a tall tree or on a cliff ledge. Both red-tailed hawk parents will incubate a brood of 2-3 whitish, blotched, or speckled eggs for 30-35 days, and the young birds will remain in the nest for 42-45 days. Both parents care for the hatchlings in the nest and for several weeks after the juvenile birds begin to explore on their own. Because of this extended parental care period, a mated pair of hawks will raise just one brood per year. While red-tailed hawks are not considered threatened or endangered, they are at risk from poisoning. Poorly controlled pesticide and rodenticide use is a grave threat to these raptors, as the birds will ingest contaminated prey. They are also susceptible to collisions with power lines and wind turbines, and will occasionally be hit by cars if the birds are hunting or feeding on the side of the road. These are not common backyard birds, but birders with large, undeveloped acreage may attract red-tailed hawks by leaving dead trees and fence posts available as perches. Ensuring that grassland or nearby fields are left undisturbed for small mammals and other prey will also help attract hunting hawks to an area. Red-tailed hawks are not difficult to find within their range if birders drive on rural roads and check roadside perches for watchful raptors. Areas with less development are more apt to yield red-tailed hawk sightings, though these birds can also be found in suburban and even urban areas where prey such as mice and pigeons is plentiful. In flight, look for the distinctive wing pattern of these hawks while soaring for an easy, confident identification. Because of their widespread familiarity, red-tailed hawks are popular school mascots. For example, the University of Utah honors its red-tailed hawk mascot, Swoop, at football games and other school events, with occasional appearances of live red-tailed hawks from local falconers or wild bird rehabilitation facilities. The school adopted Swoop as an official mascot in 1996, with the full consent of the Ute tribe. Be sure to check out our other detailed bird fact files to learn more about all types of the world's 10,000 bird species!